Well, long story short. It was my father who made these dolls, and gave me a trio after shooting. 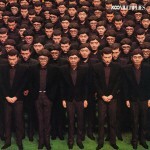 I was so happy and so proud because I was a big fan of YMO. 25 years later a set of these three dolls was priced at 1,500,000 yen on a TV show! Me, I don’t understand Chinese. © 1995-2019 Kyo Ichida, Some Rights Reserved.